Positive reinforcement: I teach with the food and a reward marker. Training, by definition, either steals from the horse’s flight response (negative reinforcement) or taps into the seeking system and food acquisition (positive reinforcement). When we exploit the flight response, the triggered emotional state is one of mild fear and scarcity, energy will run out. When we engage the seeking system, the triggered emotional state is one of interest and abundance, there is more food available. I want to classically condition abundance and joy in my horses. It should be a visible by-product of having a good process and we call it a “ven animal”. Biomechanical alignment: My horses are taught to move with correct biomechanics in order to remain sound and strong. You cannot break the laws of biomechanics without damaging the horse. These laws are immutable no matter what kind of horses you train or what method you teach with. Respect for the physical animal in front of me is paramount. The way a behavior is performed is more important than the behavior itself: A motor pattern created in tension, confusion or with incorrect posture has no value. Initial acquisition of a skill is exciting, but there are usually fine details to be shaped before the horse can perform with full confidence, balance and joy. These can include a deeper reinforcement history, breaking down component parts into smaller pieces and rehearsal to build confidence. Additionally, much of good horse training consists of physical skills that need to be layered in progressively as the horse is athletically prepared. Thanks for the kind comments! I do train full time. I mainly work in dog behavior, going in home for dogs who are reactive, fearful or aggressive. I work with pretty severe cases and that’s been how I’ve earned my living for about the last 10 years. I have studied horse training pretty intensively under Alexandra Kurland for the last three years (I had a childhood/young adult life in traditional horsemanship) and I have a few students of my own. I teach private owners with their horses who want to work in a new paradigm and give lessons to complete newbies with my own herd of 5. I love introducing people to horses using positive reinforcement. I’m about 3/4 dog behavior and 1/4 horse clicker training as far as making a living. May I share your latest blog entry about ‘transformation spells’ with people on the ITS ABOUT THE HORSE BLOG and the people at THEHORSEAGILITYCLUB? It is a wonderful description of learning to be and become. Please feel free to share any of my blog posts:) Thanks so much for reading and commenting. I’ll have to check out those sites! Yes, magic was indeed captivating as a youngster and even now I know it is illusion it still thrills me. 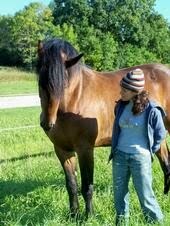 Hi–I am just getting back into riding as an adult and I am interested in reading more about horsemanship. Do you have any book recommendations? Thank you for your blog! Wow, I am thrilled to find your blog! I am currently in KPA and also getting prepared to bring home my first horse since being introduced to clicker training. I want to do this right! I am searching for resources on clicker training horses and you blogs are perfect. I plan to do a lot of conditioning and groundwork in preparation for endurance riding but I have a dressage background. You may get some videos heading you way in a few months! That’s great, congratulations! I would love to “meet” your new horse via video. What a lucky horse and what a wonderful journey you have in front of you. Keep me posted and have fun! Just discovered your site.. and very interestd in your articles. When I first started with him 10 months ago, he was a little bugger..cross and narky, very bargy, headstrong and would take off with me. Last september he took off with me and then reared vertically and scared me big time.. It was a bad situation all round, unfamiliar surroundings and with starnge horses, and of course I hadnt had much experience with him. The incident was as much my fault as his…more really. I had a choice.. I could have walked away or try to understand and learn from the incident. The owner wasnt impressed with what had happened but gave me ‘another chance’ with him. I’m an active older rider with no experience of training and a patchy riding past.. beyond novice, on the verge of intermediate, but with history of scary riding injury. Anyway.. I decided to start from scratch. I googled everything I could on how to be more competent and quietly assertive at dealing with this naughty pony and I learned some basic groundwork stuff, including getting his head down, flexing his neck and getting his hind legs under him a bit..didnt ride at all for a month or so then just briefly and after at least an hour of patient catching him, grooming and groundwork. Long story short, 6 months later we’re a much happier pair.. he’s still cheeky of course and tests me..(he’s a pony..!) but leads well, never barges me around now and is easier to catch… We hack out alone now, we’ve had some lessons, I school him as best I can at least twice a week and do some basic manners lessons before EVERY rideout or schooling session asking for moving over and shifting his feet etc. Also gently asking for head down and flexion. He still rides on a pelham which has really taught me to be lighter with my hands, but it is my safety net in case he does take off..! . He’s also moving much straighter now and has at least a little more bend too..and a bit softer now that I’m softer with my hands, but nowhere near what I understand to be ‘on the bit’. We’ve had horrendous rain and storms here in Ireland since November and the outdoor arena has been too wet for lessons or longer schooloing sessions, and too wet for any cantering, so we’re a bit behind the work now. Sorry to have written such a long and winding message..
What I’m really interested in now is how to move on with the work. I know some of the basics of lunging, groundwork and schoolong, but now that I’ve got a pony that’s listening, calmer and even joining up.. where do I go next? I need some specific techniques/info on how to lunge to get his head /neck down, his hind end under him etc.. (I’m using a rope halter). I will get back to lessons once a month once the weater improves. In the meantime I need something new but within my abilities.. He’s WELL able..! it’s just for me to be able to ask properly..! I loved your groundwork articles Jen.. Fully agree that it’s such a huge part of gaining mutual trust and learing about your horse no matter what..